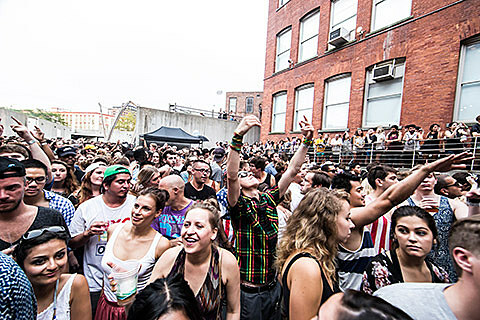 The annual Warm Up summer concert series of mostly electronic music (but other genres too) returns in 2015 every Saturday from June 27 to September 5 at MoMA PS1. Like in past years, doors open at noon and the shows go from 3-9 PM. Admission is $18 in advance or $20 day of. As usual, they’ve got a great lineup, including Cut Copy (DJs), Boys Noize, Baauer, Samantha Urbani, AG Cook, Skepta, Despot, Bok Bok, Busy P b2b Boston Bun, Lotic, Lafawndah, Sicko Mobb, Rabit, Untold, Vessel, Ninos Du Brasil, Cut Hands, Laraaji, Vision Fortune, Jlin, Tiga and many more.